2018 Pima Federal Golf Classic Volunteer Staff at the Golf Club at Dove Mountain. 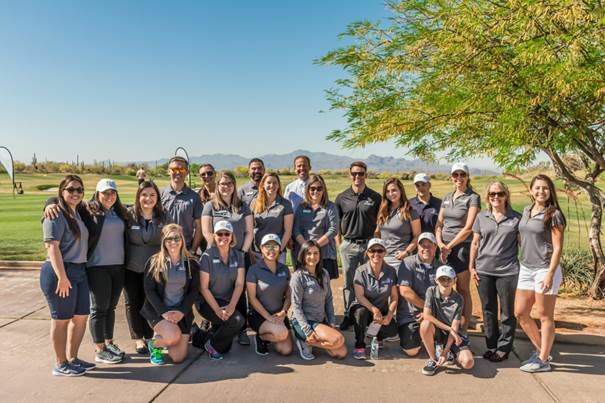 Pima Federal Credit Union: The credit union’s sixth annual Pima Federal Golf Classic raised $50,000 for Tucson Values Teachers. The funds will be used to purchase $50 gift cards that will be handed out to local teachers to purchase school supplies for their classroom. The Golf Classic was created in 2013 with a goal of raising funds to help local teachers purchase needed school supplies. Since its inception, the event has raised $367,000. The Credit Union is the largest community investor in the annual Tucson Supplies Teachers supply drive, according to Katie Rogerson, TVT’s chief operations officer. Teachers can request gift cards at tucsonvaluesteachers.org. Larry H. Miller Dealerships: The dealership group is awarding a $10,000 grant to Nourish to support children with feeding challenges. The donation will support the Tucson-based nonprofit’s Feeding and Nutrition Scholarship Program, which funds feeding or nutrition therapy to support babies and children learning to eat and parents learning to feed them. The program offsets costs not covered by insurance. Through its charitable organization, Larry H. Miller Charities, more than $1.2 million have been donated to qualified nonprofit organizations in Arizona. Lyft: The ride-hailing service announced a new program to support the work of Tucson-area nonprofit organizations. Every month, starting in July, Lyft will award one nonprofit $1,000 in Lyft ride credits to ease transportation challenges and support their work to create positive change in the Tucson region. Recipients are selected through a competitive application process. For more information or to apply, visit tucne.ws/lyftgrants. Submit items about charitable donations by local businesses or nonprofits to business@tucson.com; please use Giving Back in the email subject line and include photos in JPEG format. Sign up for a weekly update of business headlines at Tucson.com/business.